Explanation: On July 5th, wandering planets, bright stars, and a young crescent Moon graced western skies after sunset. Arrayed along the solar system's ecliptic plane, the three celestial beacons forming this skyscape's eye-catching line-up with the Moon are Saturn (upper left), then Mars, and finally Regulus, alpha star of the constellation Leo. 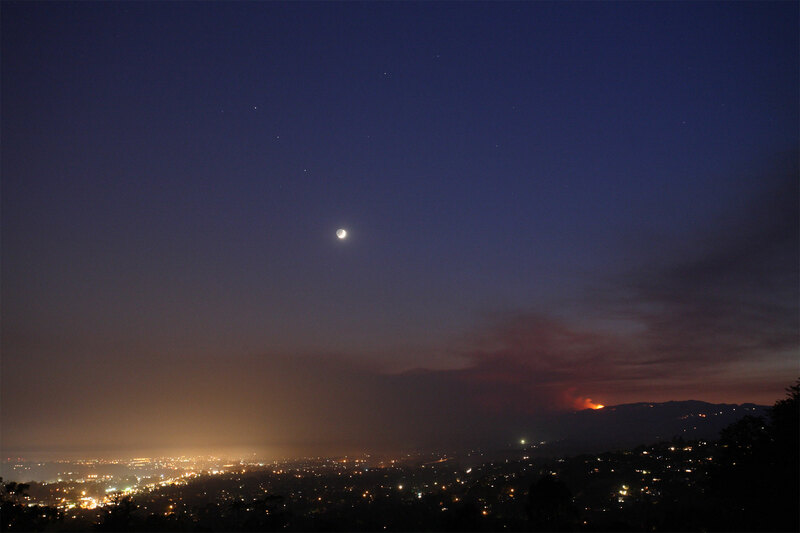 Of course planet Earth itself lies in the foreground, a scene dominated by the city lights of Santa Barbara, California. The smoky haze hanging over the city is from threatening wild fires still burning along the hill at the right. On Thursday evening, Saturn and Mars can be seen in a much closer pairing or conjunction, separated by only about 3/4 degree on the sky.